I enjoy doing needlework. My mother taught me to embroider at a young age, and although I’ve neglected this craft for a while, I’m picking it up again. 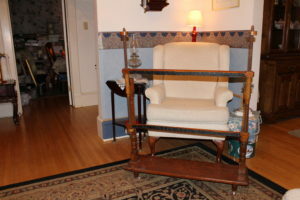 Most of the work I do is hoop work, but sometimes a stretcher bar is necessary or even a needlework stand is needed. I have a “giraffe” style needlework stand and it serves its purpose but is not attractive. I’m a fan of the new “Poldark” on PBS and in one of the episodes in Season 1, Elizabeth Poldark is using a gorgeous needlework stand to do her crewel work. I instantly wanted one; it looked like a piece of furniture and would look like it belonged in my parlor. The search was on! I scoured various sites for about a year before I found this beauty. It dates to the 1890s and is in excellent shape for its age. I plan on doing large crewel and needlepoint pieces on it, and hope to put it in service soon! My antique needlework stand, just waiting to hold a piece of canvas so I can stitch something pretty!